1. Snottey Greenpool – American swimmer who picked up a silver medal behind Michael Phelps in five events and is still waiting to be interviewed by American TV in the mixed zone. 2. Konstantli Fallinova – Ukrainian distance runner who paused to help Mo Farah back to his feet in the 10000m only to be lapped by the British athlete ten minutes later. 3. Malaria Shok – Romanian sailor whom organisers did their best to keep off-shore. 4. Jung-al-Kanopi – Out of favour Qatari athlete hardly seen in Brazil having been a major presence there for many years. 5. M.T.C. Ting – Thai Beach Volleyballer who has attracted little attention despite being a regular on our screens. 6. Guus Pairinoff – Dutch cyclist specialising in tandem events and much sought after by the Daily Mail. 7. Braak Keerfu – Sent home for the South African synchronised arm-wrestling team for unspecified reasons. 9. Viagra – Exciting Brazilian footballer now an iconic veteran. 10. Lord Teflon – IOC member. Igloo Igloosson – Iceland’s centre-back is built like an ice outhouse and is renowned back home for his cool head (and arms, torso and legs) in one-to-ones. Is rumoured to be a cousin of Bjork – as is the rest of the squad. Benny Bjornsson – Sweden’s defensive midfielder whose partnership with Bjorn Bennysson has provided a platform for the twin strikers who have caught the eye upfront. First noticed playing in the Belgian Second Division (for Waterloo Chargers) he will be a designated penalty taker if involved in shoot-outs, having successfully pleaded with his boss to “Take a chance on me”. Vaseline Slidezin – The Czech’s strength is his box to box work, always finding the space he needs to come good with his ball play. A slippery customer, defenders will aim to keep a tight grip on him. Snappa Bollokov – Uncompromising Albanian full-back whose tackling has attracted the attention of referees (and opposition physios) over the years, with a career record 25 red cards in his 103 international appearances. Nicknamed “The Castrator” by his fans at ICU Tirana. Kuck Uklokk – Swiss midfielder who sets the rhythm of his team’s play popping up regularly in the opposition penalty box where he impresses in the air. Temperament suspect however, as he can be wound up by opponents. Idon Shotalodeov – Russian who comes alive in the box where his explosive skills, particularly with his head, can cause chaos. Does go out of the game for long periods, but can spring to life if balls are stroked through to him. Nosfer Ratu – Romanian forward who openly admits to basing his game on his idol Luis Suarez. Has notched 10 international goals, all of which were scored in floodlit matches. Good on the wing, and, though very left-footed, prefers to play on the right and cut inside as he claims not to like crosses. Badi – Widely tipped as successor to Xavi, the Spanish midfielder’s career has been stalled by disciplinary problems, but he is now being mentored by Sergio Ramos. Recently linked to a move to Manchester United (along with the other 22 members of the squad). Pepe Lepew – French star who can be irresistible when his tail is up. Fans will hope that recent rumours of multiple romantic liaisons (which have caused a stink in France) will not affect his play. Linked with a possible move to Newcastle United or Juventus. Ryan O’Leary – Irish goalkeeper, known for charging (out of his area) for everything, but also good in the air and usually delivers in Europe. At corners, he can usually find space in a congested six yard box. Like the rest of the squad, it’s his first international tournament, so he brings no baggage with him. Shaking the earth from his greatcoat and pulling his cap down over his eyes, Adolf Hitler stands up and looks at what has become of the site of his Berlin bunker. He sees the grim concrete blocks of postwar reconstruction and the kids playing football, one in a Ronaldo 7 shirt. He ponders his fate, but not for long, secure that his convictions about Germany and politics and believing that his brand of agitprop is universally applicable. Oliver Massuci is devastating as Hitler. A montage early on reminds us of how the Führer has been played by others, but Massuci carves out an interpretation all his own, from his historically inaccurate height to his charismatic wit (both conscious and unconscious). Sometimes he makes people laugh the nervous laugh of those who aren’t sure if violence is just a step away; sometimes he makes people laugh because he’s funny; and sometimes, critically, he stops people laughing at all. This is the power of Nuremberg brought down to a human level, but just as dangerous. This Hitler recoils from the excesses of 20th century television, so when he finds a home as an Ali G figure on a struggling commercial channel, he foregoes the demagoguery and peddles his message of hate through a polite, even charming, insistence. In these moments and in the scenes on public streets and in meetings, and, brilliantly, on teenagers’ YouTube channels, the satire really bites down hard. In this Hitler’s appeal to the self-defined disenfranchised, the inchoately angry, the Little Man of Wilhelm Reich’s imagination, we see not the bogeyman of the past, but a thoroughly 21st century operator. In his scapegoating of The Other, we see fascism’s divide and rule philosophy, but we also see the popular Press of today cheerleading for morally bankrupt politicians. Filmed in eye-bleeding HD, though David Wnendt’s camera also carries echoes of Leni Riefenstahl’s cinematography in Triumph of the Will, we’re never in any doubt that Hitler’s ideology is establishing a home in the 21st century. If that’s the engine of the plot, less successful is a rather pedestrian subplot concerning a failing documentary filmmaker working on a failing TV station (but it does, at least, allow everyone to enjoy a drop dead perfect Downfall parody which the cast got through, somehow, without corpsing). If you do keep catching yourself wondering “Didn’t that happen in Borat?”, it doesn’t matter. Because, though this black comedy is often very funny, this film is about a chillingly realised, horribly credible resurrection of a uniquely evil man, but one whose narrative of evil is gaining ground every day. Just look at the papers in Britain and the television in the USA: Look Who’s Back could easily be titled Look What’s Back. 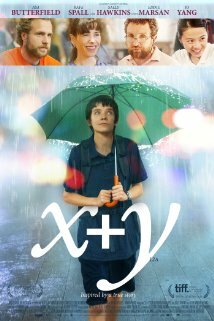 Though you know it’s coming as it’s been signposted like Chekhov’s Gun, there’s a real gut churner in the last ten minutes of X + Y – and, for an old seen-it-all type like me, that’s irrefutable proof that this film is a notch or two above the “awkward geniuses at Cambridge” fare that will follow the successes of the award-laden Turing and Hawking movies. Our hero this time round is Nathan (Asa Butterfield in a nicely understated performance), a kid with more baggage than Heathrow at 7.00am on a Monday morning. No dodging the doctors here – we’re told upfront that Nathan is autistic – and he’s soon locked into his own world, with the patterns and predictability of numbers providing all the company he needs. He’s dealing with more than the spectrum, as if that wasn’t enough! But the kid can do maths like Mozart could do music, so he’s soon on his way to Taiwan for a brutal selection boot camp for Team GB’s squad limbering up for the International Mathematics Olympiad (to be held in Cambridge – natch). There he meets kids even brighter (and even more extreme) than he is, which lends him some perspective; but his life really changes when he’s paired off with Chinese hopeful Zhang Mei (Jo Yang, who has plenty of everything needed to break down any teenage boy’s defences). Nathan learns that some things in life don’t reduce to binary numbers and edges towards the empathy that his autism has denied for so long. It’s easy to spot a little Harry Potter here, a soupçon of His Dark Materials there and a light sprinkling of Spellbound (the Spelling Bee movie), but, somehow, the movie cliches (and they do keep coming) glide past painlessly. That’s a testament to highly impressive cinematography from Danny Cohen, who captures the contrast between urban Taiwan and the straight lines of the classroom with an elegance that made me very pleased that I was watching the film in a cinema. Praise too for Rafe Spall and Sally Hawkins as Nathan’s teacher and mother, two characters who made me groan when introduced – they might as well have been written with a cookie-cutter – but two splendid performances carried an over-familiar subplot along with aplomb. Perhaps the best recommendation for the movie comes not from me but from my two teenage boy mathematicians (they’re not at Nathan and Zhang Mei’s level, but they’re good). Asked if they liked it, they drawled “Yeah – it was good. Yeah” which is about as much as one can wrench from boys aged 14 and 17. Then I thought a bit and realised that they had hardly moved through the film’s 111 minutes – no squirming, no grabbing for their drinks, no kicking off shoes. That told me that they identified with and cared about the boy on screen and those trying to relate to him. And I hope, when their turn comes to step out of their comfort zones as life “gets complicated”, they’ll recall this film’s central message – because sometimes the best things in life just don’t add up, no matter how much maths you know. How’s the picture in the attic Paul? 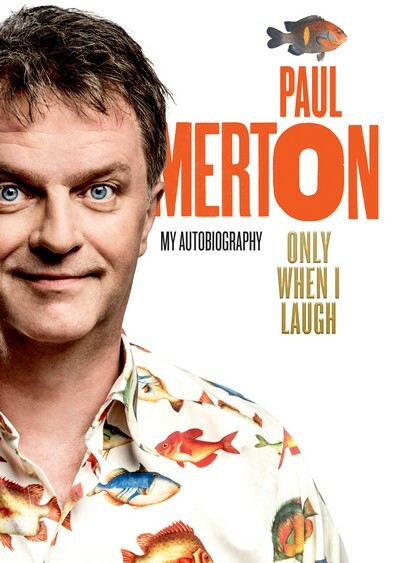 I saw Paul Merton once — at Jongleurs in Battersea in about 1989. He was funny, but not spectacularly so — though the success or otherwise of a comic’s set was determined as much by my beer gauge (about five pints imbibed was perfect: a few either side of that mark, and the reception was less than optimum). He was already a star, but has since gone on to become — wait for it — a national treasure, pulling off the remarkable trick of retaining most of his cultish appeal while working extensively right across the mainstream. Like Michael Palin, he seems both ubiquitous and loved, a granny’s favourite who can still show the fangs when he needs to. It’s clear that this oft-lonely, oft-insecure, only child has never had any problem getting people to like him — a rare and precious gift — but that he doesn’t always like himself, nor others. If that less than earth-shattering revelation about a funnyman emerges from the text, I’m afraid it’s one of the few. Not that it makes for a bad book or a whitewashing whinge or a backstabbing bitchfest. What we get is a narrative of Paul’s outward life. There’s a lot of, “The phone rang and soon I was on my way to a lunch meeting about a new six-part series about which, I confess, I had many doubts but that proved to be one of the biggest hits of the decade”. It’s not short of, “We fell in love and soon we were renting a little / large flat in Streatham / Fulham”. either. How Paul? How? This absence of introspection (strange in a man who has thought very hard indeed about how comedy is created in the cracks between what the mind expects and what it obtains) is most apparent in the book’s central interlude in which he is falls prey to paranoid delusions brought on by anti-malaria meds (his explanation) and overwork (my speculation) and spends some time in hospital pretty much run on the along the lines of One Flew Over The Cuckoo’s Nest. The horrors of mental illness are described unflinchingly, but, on his discharge, normal life is resumed as if nothing had happened with little more than a footnote that his marriage to Caroline Quentin fell apart soon after. Enough of the downside — the upside is plenty steep enough. The best parts of the book are those handful of occasions where he drops a gag into the text (though the economy and almost tangible crafting of the joke contrasts with the somewhat pedestrian description of “things happening” that surrounds it). Writing was hard graft, demanding hours of work (often with longtime collaborator, John Irwin) drawing on an immense reservoir of self-acquired knowledge of classic comedy from radio, television and film, accumulated since early childhood. Though often self-effacing, Merton is proud of his work and his awards and not dishonest enough to hide it. There are also many warm tributes paid to a Who’s Who of British comedy over the last fifty years: Forsyth, Milligan, Galton and Simpson, Hislop, Parsons and many, many more emerge with an enhanced humanity for Merton’s accounts of his dealings with them, especially his waspish sparring partner from HIGNFY. This warmth is most evident when he breaks his leg in an ill-advised football kickabout and loses money on a cancelled Edinburgh run. A starry list of “alternative” comics show that all the previous stuff about the camaraderie on the road was no soft-soaping, as they club together to raise money to settle his debts with a one-off gig. Come the last page of the book, one can only be satisfied that things have worked out so well for a man who had to swim against the tide so often — no Footlights conveyor-belt to the BBC for him — his domestic and professional lives balanced beautifully in his mid-50s. But there’s still much more to say, more to reveal, depths hinted at but not plumbed — which is, of course, the right of an author — but nags at the reader. One can’t help wondering what a biographer with psychological insight would make of Merton’s mind, a fecund but not entirely comfortable place and how that has carried him on his unique and still unfolding journey. For that we must wait. Volume 2 picks up where Volume 1 stopped… except that it doesn’t really. More so than Going To Sea In A Sieve (reviewed here) Alarming starts out of synch (with a 24 carat gold story that should have been in Sieve) and continues with tales only loosely related to a conventional temporal sequence. It’s more a scrapbook with some of the pages missing and some of the pages a little out of order – but it’s no less enjoyable for it! There are some wonderful yarns: getting shot, twice; never quite getting to award shows in quite the right gear; Twizzle, the family dog, and his vendetta with the scrapyard mutt over the fence; and many, many more about Spud, DB’s hero, father, muse. There’s more – plenty more and the temptation to throw in a few spoilers here is almost overpowering! But that is exactly what one would expect from all those radio shows that mine the seemingly inexhaustible seam of “things that have happened to me”. The tales transfer from the mic to the page with no loss of comic timing and with the same curious combination of self-deprecation and glee at being the centre of attention one more time. This is Danny the Showman, Danny the Turn, Danny the Holder of Court – the Danny that many consider a national treasure (sorry, but that is the mot juste) and some find insufferable. But for all the parading of his working class cultural credentials (and they do ring true – my brother was also shot for a laugh and also laughed it off) and his Floyd Mayweatherly approach to money, the book hints at something deeper, something that he himself has often remarked that comics should avoid, as it’s much harder to make people laugh than to make them cry, or rise in anger, or even just think. When DB does serious, it’s not like Mike Yarwood singing, “And this is me,” so provoking every viewer to switch over. DB is very good at serious. He didn’t like being called a “Professional Cockney” reasoning, with some justification, that this was merely a veiling of a “Cockney” who should know his place amongst the Oxbridge media types. But how did that passive aggression towards him manifest itself? How was he patronised? Who did it? DB is not really one to name names or dish the dirt – like writing about his brother’s untimely death, that wouldn’t sit with the book’s overarching motif of the hat on the side of the head, luck just turning up to sort things out, life consisting of one sunny day after another. So we don’t really find out. The relentless optimistic timbre does make the occasional cymbal clash resonate though. There’s a rant (like some of his more celebrated radio meltdowns, it’s directed at faceless managers whose job it is to impose order on what should be chaotic) that underlines his firm ideas about what is valuable in life and what isn’t. There is a real warmth evident in his feelings towards Paul Gascoigne (and a rare moment of regret at the friendship’s fading) and plenty that suggests how the inevitably “troubled” ex-footballer connected to his kind – and some pranks that makes Gazza sound like a Bullingdon Boy had he gone to Eton and not Heathfield Senior High, Gateshead. An acid account of journalistic manipulation of an interview also bares teeth that are otherwise reserved for smiling at life’s crazy coincidences – meeting The Queen in Deptford anyone? The pages roar by, the laughs keep coming – yes, I lolled on the Tube and two or three times forced my son to read a few pages that were just too funny to miss – but there’s another, more balanced book buried inside these pages with many tales left out (still no giant firework in the LWT lift, my favourite of the many, many stories he has told on the radio). So, before we get to Volume 3 and the cancer, let’s have something that is not more serious – that would be the wrong word – but something that gets beyond the overdeveloped Baker funnybone. There is a precedent and it comes from one of his heroes – PG Wodehouse. The greatest comic novelist wrote about serious matters in his Berlin Broadcasts. Hopelessly misjudged though they were, the transcripts balance PGW’s almost pathological need to entertain with a hard-edged account of what it was like to be a POW and why those left at home should not think that their incarcerated loved ones were in agony 24 hours a day (at least not those banged up with PGW). Put to happier purpose, DB’s gift for entertainment could tell us a lot about where the working class of England’s big cities have gone and why so many are disconnected from politics and culture. That might never come fully formed, but it’s there hidden, somewhere between the cracks of this too-soon-finished rattle through some of the jests and japes of the Daz Doorstep Challenge Man (and so much more).